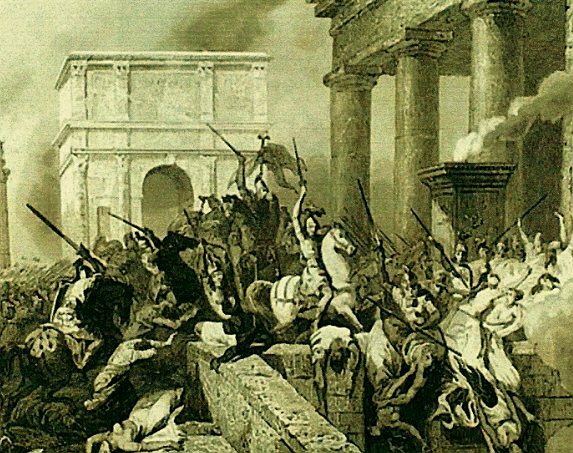 Over the past century many commentators have remarked on the parallels between the modern West and ancient Rome in its period of decadence and decline. The most influential proponent of the idea, perhaps, has been Oswald Spengler, whose Decline of the West is now widely viewed as a classic of conservative thought. As might be imagined, “progressives” have consistently sneered at the idea, but, then again, they would scarcely be progressives if they didn’t. In 410 A.D. the walls of Rome were breached and the city plundered by a barbarian army under the leadership of Alaric the Goth. This was the first time since the Gallic sack of the city around 390 B.C. that the imperial metropolis had been entered by a hostile enemy. The fall of Rome shocked the world at the time, but what is not generally known nowadays is that the Gothic army that carried out the atrocity had entered the Empire thirty years earlier as refugees. Until the second half of the fourth century the Goths had inhabited a vast swathe of territory taking what now comprises Romania as well as the Ukraine. In 375, however, they were attacked by the Huns, a tribe of nomad warriors from central Asia who had been moving steadily westwards during the preceding century and a half. In the ensuing war the Goths suffered a crushing defeat and large numbers of them fled westwards towards the Roman Empire. The Eastern Emperor Valens, at that moment stationed in Antioch, eventually gave permission for the Therving tribe, which comprised about half the total number of Gothic refugees, to be ferried across the river. For at least two centuries prior to this the Romans had actively recruited barbarians into the army (necessary because of Rome’s abysmally low birth-rate) and Valens reasoned that the Goths would provide a valuable pool of new and cheap recruits. After several military disasters, the Emperor Valens made a hasty return to Constantinople to personally take charge of the campaign, and was killed in battle at Adrianople in 378 — just two years after he had sanctioned the mass immigration. A decade and a half of uneasy peace was terminated in 395 by a renewed Gothic war, this time under the leadership of Alaric. Commanding an enormous host of warriors (who were in fact officially soldiers in the Roman army) Alaric moved south from Thrace into Greece, a land which he proceeded to devastate. City after city was taken, its male population massacred, its female population raped and sold into slavery, and its wealth plundered. Finally, in 396 the Western Empire bestirred itself and its greatest general Stilicho was dispatched with a sizeable force to the relief of Hellas. After a lengthy game of cat and mouse around the Peloponnesian Peninsula the Goths were trapped by the superior science and tactics of the Roman general. Unfortunately, however, Stilicho did not prosecute the siege to its conclusion and the Goths effected a daring escape and made their way to Epirus. At this moment a Greek political philosopher named Synesius published a widely-discussed treatise on the present emergency and the measures that needed to be taken. Does all of this sound eerily familiar? Yet even worse was to come; for the patriot who had saved Greece from Alaric, the general Stilicho, was himself only a decade later denounced by the Roman ruling class and murdered, along with his entire family. This was after Stilicho had saved Italy from a second attack by Alaric, as well as from another barbarian host led by one Rhadagastus which had crossed the Alps and devastated the Po Valley.